InLiquid presents In Two Parks at Once, which is a solo exhibition by InLiquid artist member Andrea Caldarise. Her art focuses on connecting audiences with an urban space, capturing the experience of discovery, and recreating a place through memory and imagination. These maps begin at one specific moment and continue to branch out to chart the details that define a bus stop or a familiar piece of sidewalk. The maps act both as a personal guide and as an atlas for viewers to experience their own recollections through the journeys of others. Working in collage, Caldarise’s map imagery oscillates from literal to abstract, as she works to capture the ephemeral experience of navigating a cityscape. Caldarise is a painter, collage-maker, and collaborator inspired by happenstance conversations, exploring, and memories. Caldarise studied painting and art history at Tyler School of Art, Temple University where she received her BFA and completed an MA in Arts Administration at the University of Pennsylvania. She has participated in residencies at Contemporary Artists Center, Woodside, Troy, NY and Yale School of Art’s summer fellowship in Norfolk, CT. She is also an artistic collaborator with RealLivePeople, a Philadelphia-based dance company. Caldarise has exhibited her artwork in Philadelphia, Manhattan, Brooklyn, and Rome, Italy. She currently lives in Brooklyn, NY. The public hours for Crane Arts are noon – 6 pm, Wednesday – Saturday, and until 9 pm on the Second Thursday of each month. Trenton Doyle Hancock: Skin and Bones, 20 Years of Drawing chronicles the foundation and evolution of Hancock’s prolific career. The exhibition is the first in-depth examination of the artist’s extensive body of drawings, collages and works on paper. 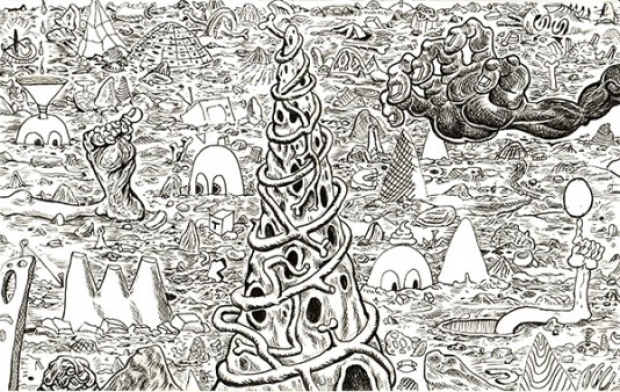 For over two decades, Hancock has immersed himself in drawing, testing the elasticity of the medium with a keen sense of humor. Hancock was born in 1974 in Oklahoma City, Oklahoma. He lives and works in Houston, Texas. In 2007, Hancock was the recipient of The Studio Museum in Harlem’s Joyce Alexander Wein Artist Prize. Organized by the Contemporary Arts Museum Houston (CAMH), Trenton Doyle Hancock: Skin and Bones, 20 Years of Drawing is curated by Valerie Cassel Oliver, Senior Curator. The Studio Museum’s presentation is organized by Lauren Haynes, Associate Curator, Permanent Collection. Trenton Doyle Hancock: Skin and Bones, 20 Years of Drawing is supported by a generous grant from the National Endowment for the Arts and other supporters of CAMH. NY Times and Art in America! 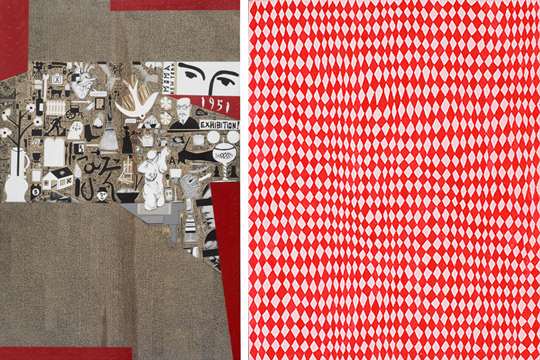 Oil, acrylic, enamel, paper, Arches W.C. paper, and shaped birch wood on 4 birch panels, 72 x 192 x 2 inches (183 x 487.7 x 5 cm). All works courtesy of the artist and Steve Turner Contemporary, Los Angeles. 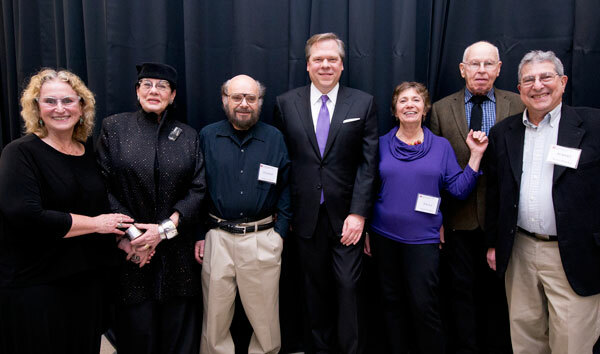 Internationally renowned artist Polly Apfelbaum was selected as the 2013 Tyler Distinguished Alumna, an annual program that is sponsored by the Dean of the Tyler School of Art. The purpose of this program is to foster continuing relationships between Tyler’s alumni and its recent graduates by combining a lecture and studio visits with the artist and selected recent graduates of Tyler. This results in a six-month paid internship for one of the graduates, culminating in a two-person exhibit to be held at Temple Contemporary in the summer of 2014. Apfelbaum delivered a lecture in 2013 at Temple Contemporary in which she spoke about her work and its inspirations. Of the numerous influences cited by Apfelbaum, the 1972 work Franklin’s Footpath by Gene Davis had a monumental impact in shaping her joint exhibition with Dan Cole (BFA 2010), the recent graduate she chose to work with through this program. Painted directly on the Benjamin Franklin Parkway in front of the Philadelphia Museum of Art, Davis’ horizontal mural of vibrant stripes was billed as “the world’s largest painting” and was made by the museum’s Department of Urban Outreach. 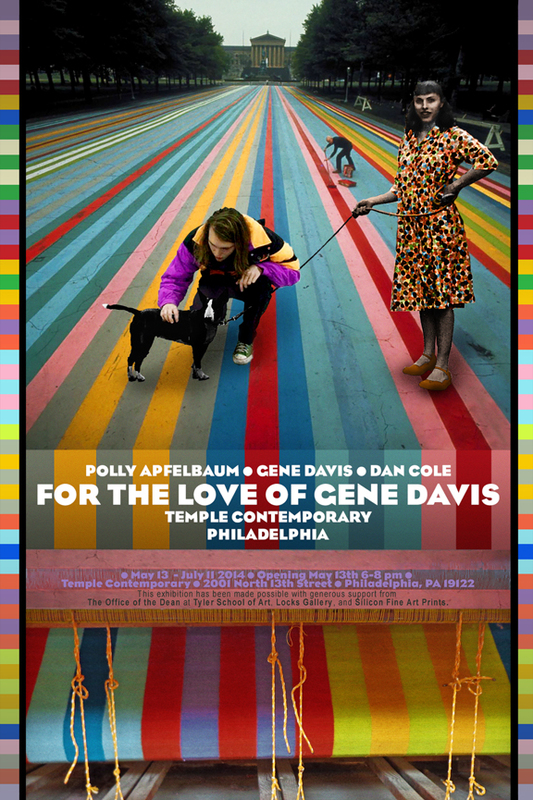 Thanks to the generous support of Locks Gallery and Silicon Fine Art Prints, Apfelbaum and Cole will be creating an immersive installation covering the walls and floor with Apfelbaum’s vision for a work that is inspired by Gene Davis’ Franklin’s Footpath, and filtered through her own unique visual vocabulary. Polly Apfelbaum is represented by Locks Galery in Philadelphia, Clifton Benevento in New York City, Frith Street Gallery, London, and Galerie Naucht St. Stephen in Vienna. A major mid-career survey of her work opened in 2003 at the Institute for Contemporary Art in Philadelphia. The exhibition traveled through 2004, and was accompanied by a catalogue surveying 15 years of her work. Apfelbaum has held recent solo exhibitions including “Color Stations,” Lumber Room Portland, Oregon (2014); "Second that emotion," Mumbai Art Room, Mumbai, India (2013); "Plainiverse," Galerie Nacht St. Stephen, Vienna, Austria (2012). Her work has been featured recently in group exhibitions including "Americana," Perez Art Museum, Miami, FL (2014); "Rewilding Modernity," Mendel Art Gallery, Saskatoon, Canada (2013); "Regarding Warhol," Metropolitan Museum of Art (2012). Her work is in the collections of the Philadelphia Museum of Art; Museum of Modern of Art, NY; and Whitney Museum of Art of American Art, among others. 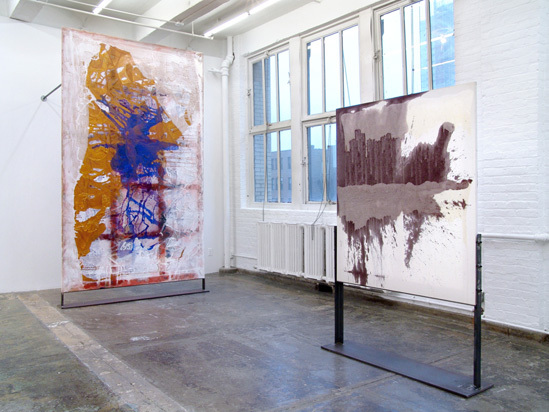 Apfelbaum was the 2013 recipient of the prestigious Rome Prize and has received numerous other grants and awards, including a Guggenheim Fellowship; an Academy Award from the American Academy of Arts and Letters; a Richard Diebenkorn Fellowship; a Joan Mitchell Fellowship; an Artist's Fellowship from the New York Foundation for the Arts; an Anonymous Was a Women Award and a Pollack-Krasner Foundation grant. "Helen, really made my career", artist Paula Winokur and Tyler alumnae explained. Hundreds of other artists across the crafts fields would certainly agree! We are pleased to honor Helen Drutt with the 2014 Tyler Tribute Award for her unparalleled contributions to American art and artists through her visionary curatorial eye, pioneering scholarship, and tireless advocacy for the modern and contemporary craft movement. She was Executive Director and a founding member of the Philadelphia Council of Professional Craftsmen (1967-1974), developer of the syllabus for the first college level course in the history of modern craft (1973), and Founder/Director of the Helen Drutt Gallery in Philadelphia (1973-2002). Her gallery was among the first in the United States to make a commitment to the modern and contemporary craft movement, and over the past forty years her archives have become a resource to scholars and institutions throughout the world. Drutt has written extensively and has curated many major exhibitions around the world. Her copious publications and essays include Brooching It Diplomatically: A Tribute to Madeleine K. Albright, Jewelry of Our Time, Peter Chang: It’s Only Plastic, Tone Vigeland: Jewellery + Sculptures: Movements in Silver, Marjorie Schick: Sculpture to Wear, Wayne Higby: Earthcloud. She penned the essay “Stanley Lechtzin: Five Decades 1959-2009” to accompany the 2009 exhibition of Lechtzin’s work at the Philadelphia Art Alliance. Major exhibitions she organized include Ten Potters, Poetics in Clay: An International Perspective, and A View from America: Contemporary Jewelry (1973-2003). Her jewelry collection, comprising works by 175 international artists, toured eleven museums around the world as Contemporary Jewellery: 1964-1994, Helen Williams Drutt Collection. Drutt was appointed as Curatorial Consultant, Modern and Contemporary Decorative Arts and Design at the Museum of Fine Arts, Houston from 2003-2006, supporting the museum’s acquisition of this collection. In 2007, the collection opened at the Museum of Fine Arts, Houston as Ornament as Art along with a catalog of the complete collection. This spring, Drutt will loan furniture by Paul Evans for an exhibit that will open at the Michener Art Museum in Doylestown and travel to the Cranbrook Art Museum (MI). Unique artist-made furnishings from her dining room will go on display at the State Hermitage Museum in St. Petersburg, Russia in 2015. Among her many honors, Drutt was awarded the Fleisher Founder’s Award from the Samuel S. Fleisher Art Memorial, Philadelphia Museum of Art (1994), was appointed Cultural Ambassador for the City of Philadelphia (1995-1999), was named Visionary! by the Museum of Art and Design, NY (1999), received the Award of Merit from the Philadelphia Art Alliance (2002), was admitted to the Goldsmith’s Hall of Fame (2004), received the Philadelphia Craft Medal from the Philadelphia Museum of Art (2006) and was honored by the Clay Studio with the exhibition A Passionate Observer: A Tribute to Helen Drutt (2009). Drutt is a BFA graduate of the Tyler School of Art (1952) and a Tyler Alumni Fellow (1991). She has received Honorary Doctorate of Arts degrees from Moore College of Art and Design (1990) and the University of the Arts (2001). had an art exhibition, The Kaleidoscope of the Mind, in Agora Gallery in New York City. illustrated The Lucky Nickel: The Story of Nickel the Sea Turtle, a children’s book by Jim Gamlin. Original artwork from the book is available on her website. displayed his work in the exhibition Location Impulsion with Nina Weiss-Kane, TYL ’80, at the Christopher Art Gallery in Chicago Heights, Ill.
displayed her work in the exhibition Location Impulsion with Michael Ryan, TYL ’79, at the Christopher Art Gallery in Chicago Heights, Ill.
exhibited the paintings of Deborah Gross-Zuchman, CLA ’69, at his gallery in Bryn Mawr, PA, as a part of the Delaware County Studio Tour. was the recipient of the 2012 Irving and Yvonne Twining Humber Award for Lifetime Artistic Achievement. The award is given to a female visual artist in Washington state, age 60 or older, who has dedicated 25 or more years of her life to creating art. had her painting, “Late Summer (Shady Trees),” added to the permanent collection of the Portland Museum of Art in Maine. participated in the Mattapoisett Library’s annual Afternoon of Poetry in Massachusetts. was appointed architecture and design historian at Ringling College of Art and Design in Sarasota, Fla.
served as public relations chair for Canstruction, an international community-service event organized by the design and construction communities. Philadelphia design teams competed by building structures made of canned food. The structures were displayed in the rotunda at Liberty Place in Center City in May. Ever wonder what happened to your former classmates, stand partners, or grad assistants?